Mea Vita: Carpe Diem: QR Code Marketing Fad? I think QR codes, in display ads, will end up being a short lived fad like the :CueCat. Advertisers who use this new barcode format are shutting out everyone else who doesn't have a device, in hand, with a camera and QR code reader application. Short URLs would be a much better alternative. Perhaps, putting the short URL next to the QR code would be a good way to include people who don't have a QR code reading device. Part of the problem is that, when your average non-techie comes across a QR code, they won't even know where to begin to figure out what it is. How many times have people wondered what that U inside a circle means on food condiments? 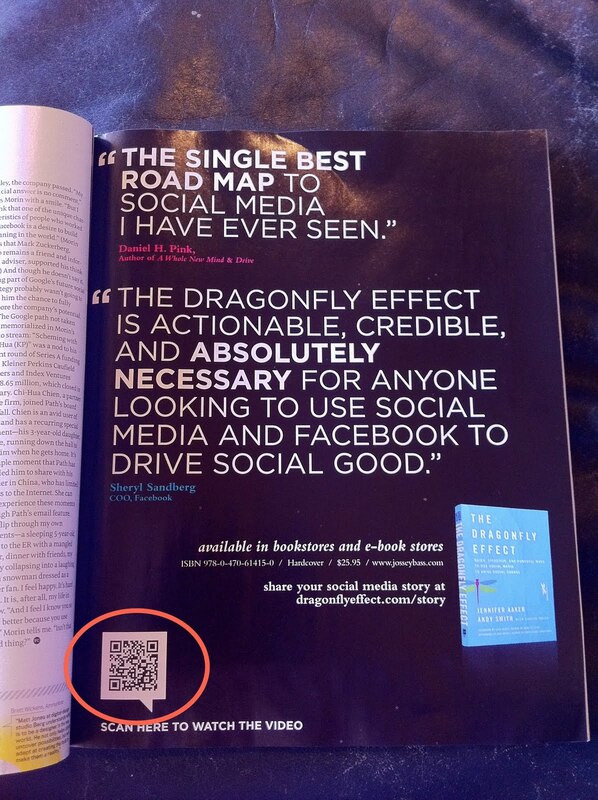 I tried out the QR code in this ad (circled in red) for The Dragonfly Effect and the experience wasn't so hot. For starters, this QR code lead me to a landscape video that would only play in portrait mode inside the QR app; and, when the video ended, there was no where to go from there (i.e., no further call to action). I think that this experience will probably get better over time, but so far, it's lacking. On the other hand, I think QR codes have a perfect place in the off line world since each QR code can contain over 4,000 characters. Imagine being able to scan a shipping container in the middle of the desert, without any network connectivity, and the QR code reporting back the container's inventory since it's all encoded in that bar code. I can see the QR code being popular with the military. What would it take for these marketing QR codes to catch on with consumers? Integrating QR code in the OS or camera driver is key. Now that would give it a fighting chance.